To all my friends still working in military facilities around the world and to the others with whom I have had the privilege to work beside: I will never forget. To all those who have had to pack their sea bag one-too-many times. To all the spouses uprooted from familiarity to uncertainty by "orders." God bless you. To the corpsman with whom I worked and still see from time to time, who gave countless hours of their time and expertise to strive for excellence every day, provided a role-model for others to emulate, and played AC/DC's "Hells Bells" after every successful catheter ablation: you guys are the best. To the military nurses who never shied away from putting and admiral in his place when it was the right thing to do, or who cried when their young patient lost their battle with leukemia, or cancer, or a million other ailments that afflict military members just like civilians. Thank you. 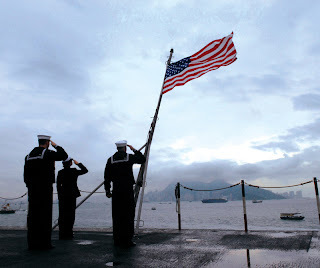 To all who stop briefly and salute the flag at "Colors" each day remember this: as you look at that flag, there are untold legions of others saluting back. New Help for Pectus Patients? Never Mind You Can't Pay - Charge It!